Take the next step in your chain maille journey and learn how to weave like the experts! 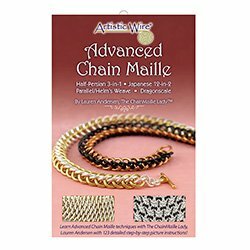 Author and chain maille aficionado Lauren Andersen guides you through these advanced techniques, which are recommended after youÃ¢â‚¬â„¢ve mastered the Basics of Chain Maille. The four patterns covered in this booklet are the Half Persian, Japanese 12-in-2, Parallel/HelmÃ¢â‚¬â„¢s Weave, and Dragonscale.